A loooong time ago, I mentioned I was doing a product review for CSN Stores. 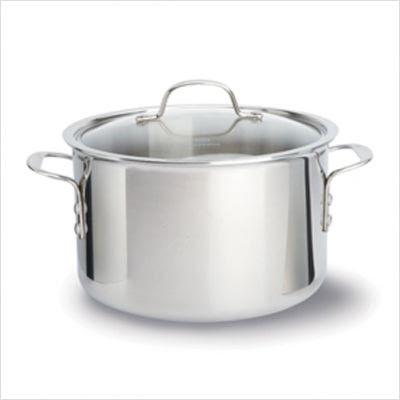 Well it took me some time to decide on a product, mainly because they have such a large selection of kitchen products, but I finally settled on this Calphalon Stainless Steel Stock Pot. It ended up being good timing because I dropped my only stockpot (a different brand) on my kitchen floor, and it dented! I was very upset because the lid no longer fit, so that sort of made my product choice easy - must replace the stock pot! This is a great product! It's so heavy and lives up the quality you'd expect from a brand like Calphalon. I highly doubt this pot would dent should I drop it, although I'm trying to be much more careful in the kitchen :) Thank you so much CSN! Now to the mittens . . . 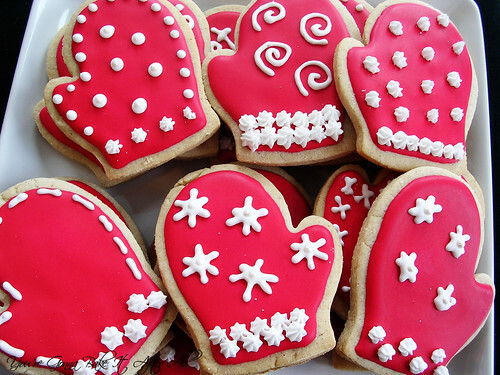 Sometime in the last year or so I saw some super cute red mitten cookies. 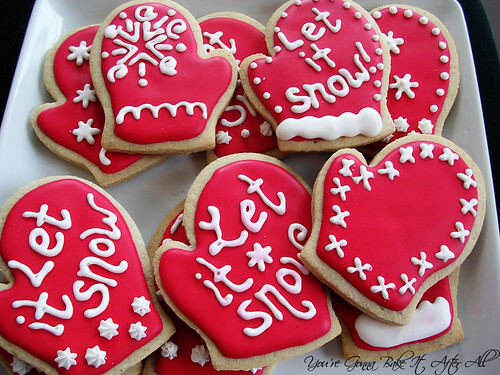 I couldn’t wait to make them for Christmas, and I actually ordered the cookie cutter this summer! 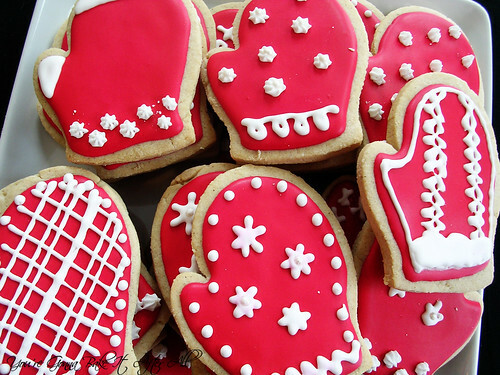 I had planned to make these mittens with Bridget’s Brown Sugar and Spice Cookies instead of my go-to sugar cookie recipe, and seeing them on Annie's Eats reaffirmed my plan. 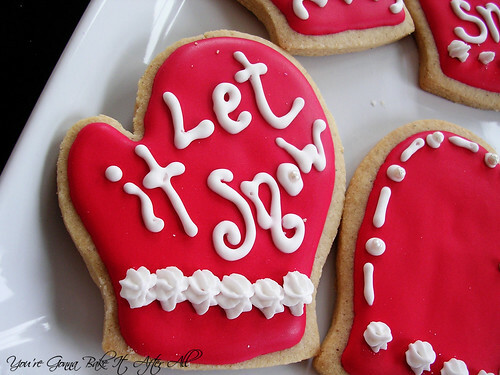 Several people have commented that they would like to learn how to do the royal icing. I have provided links to other blogs in the past, but would anyone benefit from me doing a photo-tutorial in the future? 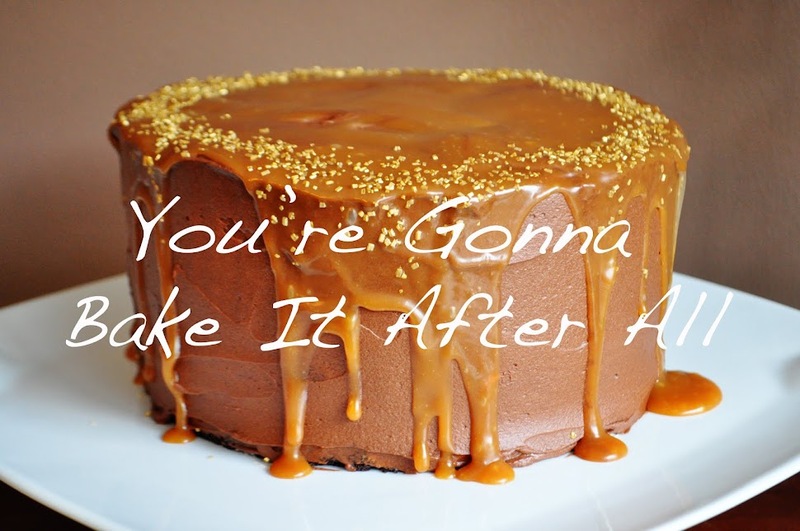 There are a lot of great tutorials on other blogs (like Marian's, Bridget's, and Annie's!) so I don’t want to do it unless it would be useful to my readers. Please let me know! 1. Whisk the flour, baking powder, and spices; set aside. 2. Cream the sugar and butter. Add the egg and extracts, and mix until well-blended. 4. Roll on a floured surface and cut into shapes. Place on parchment lined baking sheets and bake for 9 - 12 minutes, depending on the size of your cookie cutter. 5. Let sit a few minutes on the sheet, then transfer to a cooling rack. 6. 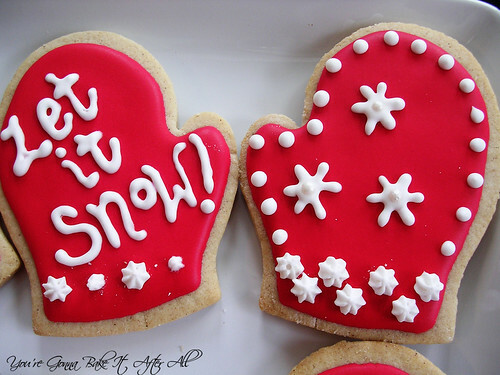 To decorate these cookies, I used a thinned royal icing glaze to outline and immediately flood (red), let that dry overnight, then used lightly thinned icing to pipe designs, plus pearl balls. Love those mittens and the stock pot looks amazing! 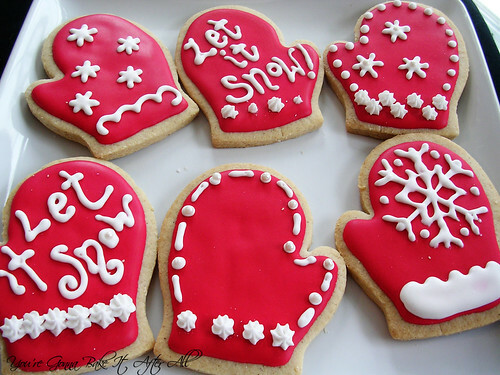 Awww, these are so cute too!! They look very yummy! Could you make them using all brown sugar?